Years ago after we opened up the wall to the office (which was once a bedroom), I realized a design flaw in my plan. 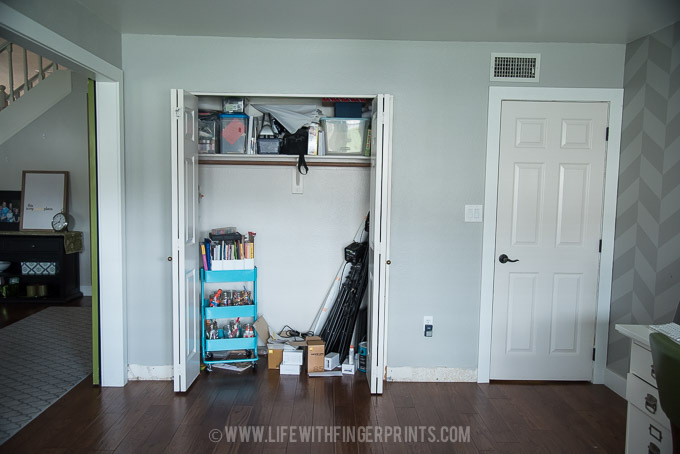 With the wall opened up, now when you walked in the front door, you immediately saw the bi-fold closet doors of the bedroom/office, it wasn’t pretty or aesthetically pleasing. It was one of those things that the minute I realized it, I knew it bothered me. But I didn’t have a great solution. We needed the closet space for storage. 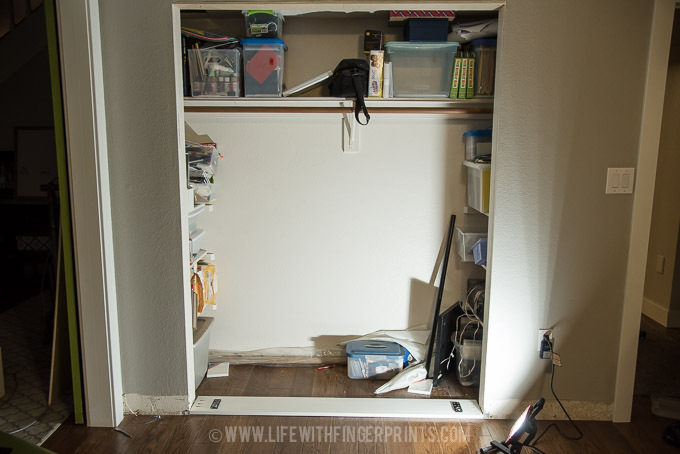 After living with it for just a bit, I came up with the solution, bookcase doors. It could be pretty and functional. But as I searched on how to do it – I couldn’t get any clear instructions. So I tabled the idea and got used to the bi-fold doors. Fast forward 4 years: With my dad’s annual trip approaching I was prepping some projects for us to work on. Figuring out the bookcase doors was high on my priority list. I contacted an expert in hidden doors and passageways to see if I could purchase hardware from him. He pointed me to a company called Murphy Door Hardware who sells DIY hardware kits. The company also sells the bookcases complete – but what fun would that be for my dad and I to work on. I purchased the hardware kit. 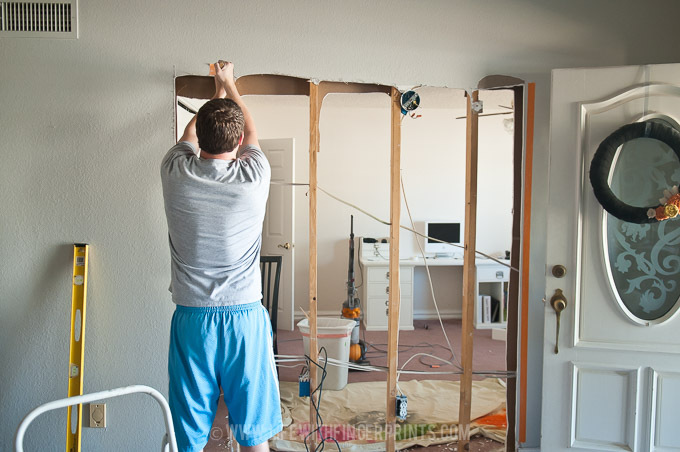 We started with a closet with bi-fold doors. 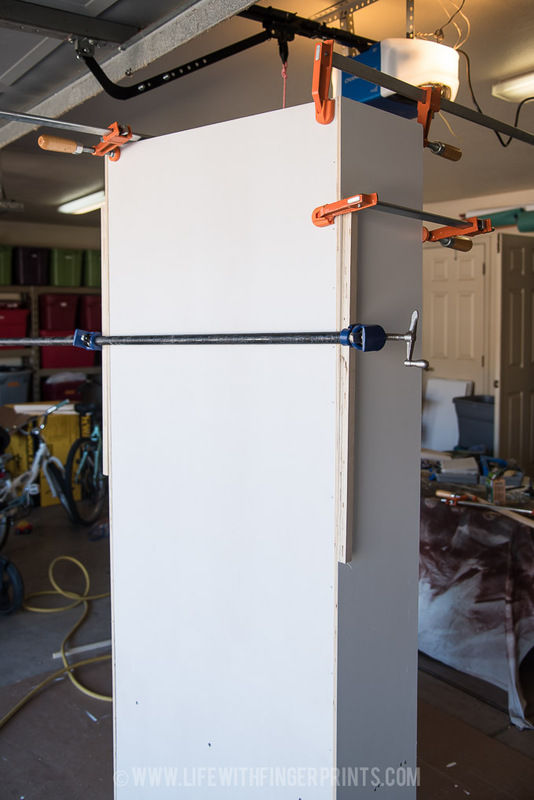 The original plan was to build a jamb for the rough opening. 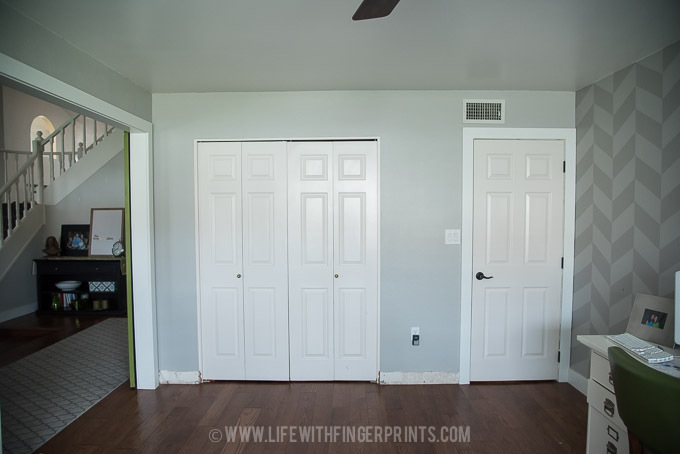 But I wanted the door to the right and the bookcases to be of similar height and if I built a jamb it created even smaller bookcases, we already had a finished opening to work with…yada, yada. 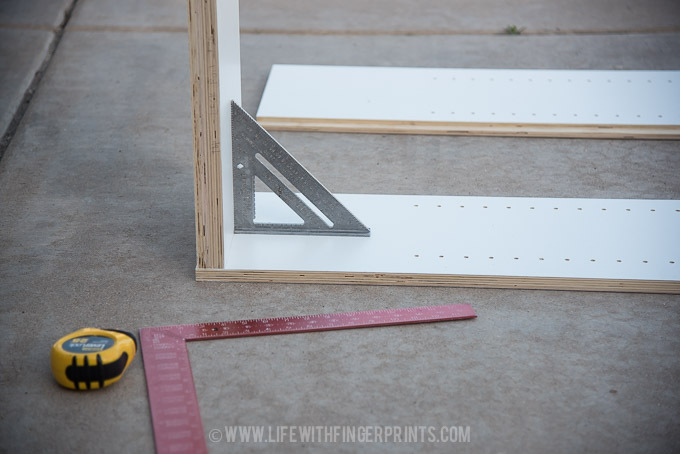 We skipped that step and my dad and I would both agree now – build in the jamb. 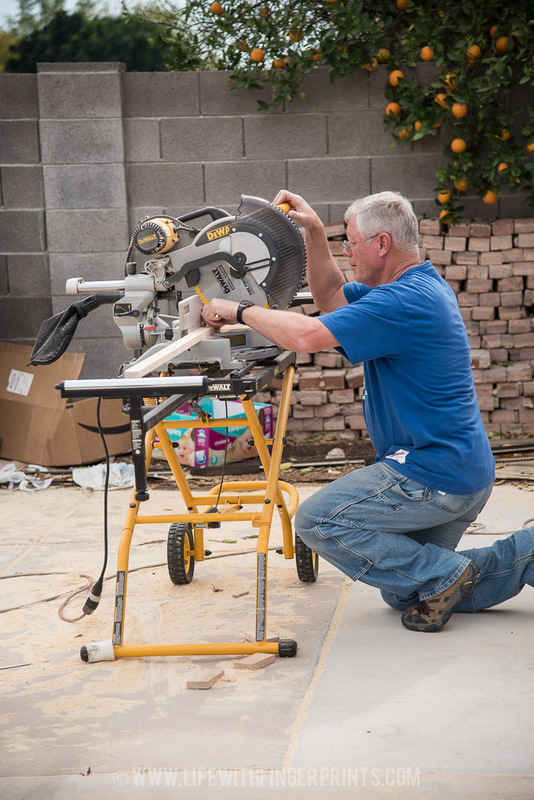 When it comes to installing – our walls weren’t entirely square (which we knew) and it made for a tough install. After we decided to skip the jamb – we went straight to building. 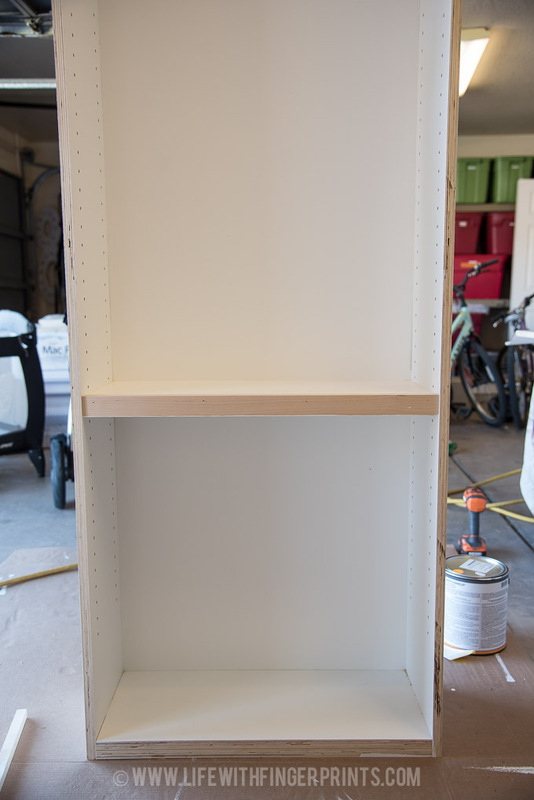 The bookcase was 11″ deep and we routed the back edge of the sides so the back wood panel would sit flush. We also cut all the shelving pieces. With the worst timing ever, my paint sprayer stopped working and was out of commission. It’s been a while since I hand painted a project like this and I was missing my sprayer. Knowing that it would be easier to paint flat pieces, everything was painted before it was put together. 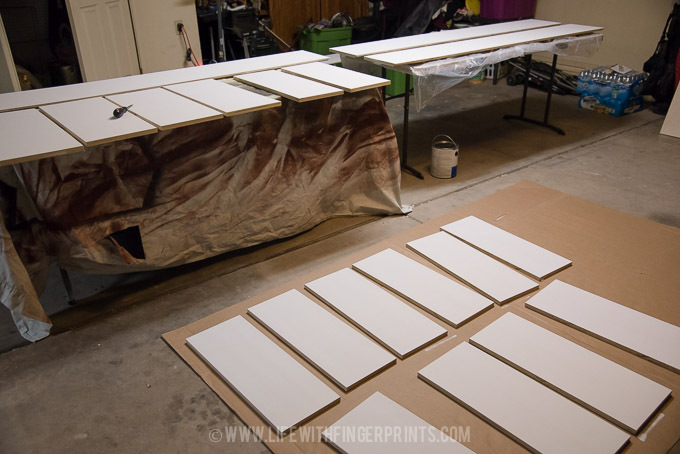 This lengthened the process of the project because we were often waiting for paint to dry in between coats. 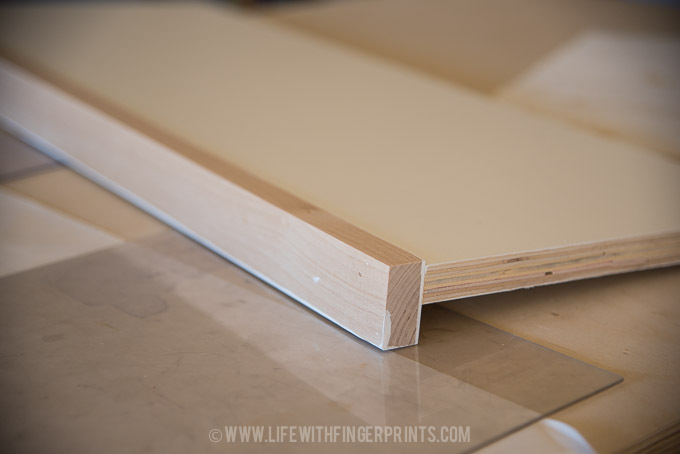 Using my kreg shelf pin jig – I drilled all the holes on the sides of the bookcases for the adjustable shelves. We then started the assembly process, making sure everything was as square as could be. For stability, one shelf was screwed into place. 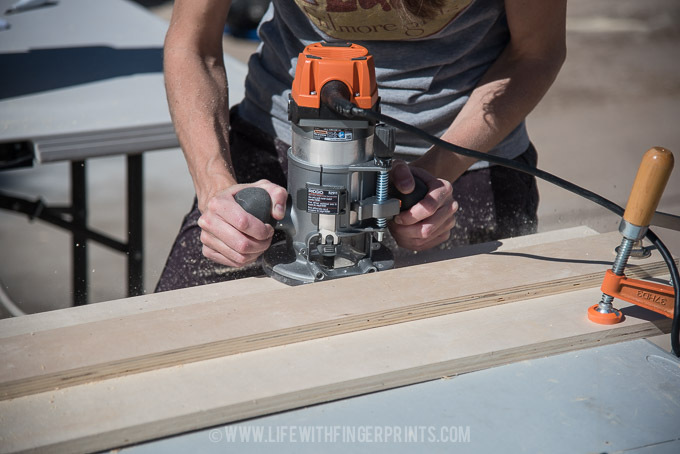 We made all the adjustable shelves using the 3/4″ plywood with a 1.5″ maple face – glue and a nail gun. As we started building the face frames (the wood to cover all the raw edges) problems started to arise. Wood was splitting and getting them square was proving to be difficult. What should’ve been a quick step ended up taking an entire afternoon. 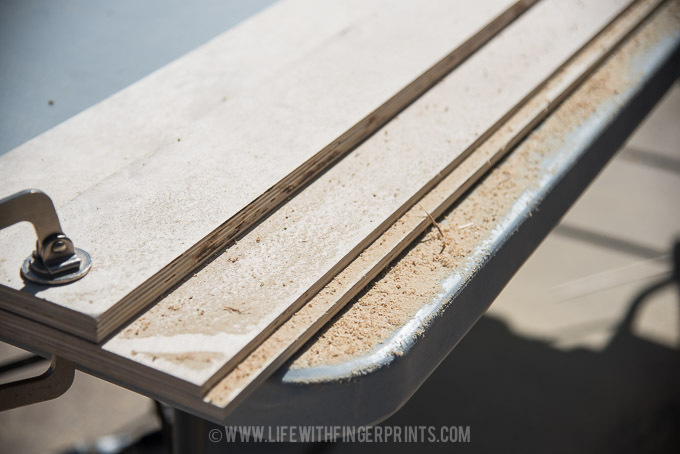 We were ready to install the face frame on the bookcase – but we decided to unconventionally attach the frames after the bookcases were installed so we could mask our imperfections. This was a crucial decision. Although when we made it, we didn’t understand how important it was. (I’ll explain more of that later). Late one night with most everyone in bed, we installed the threshold (bottom piece running across the bottom of the floor) and the bottom hardware to our kit. 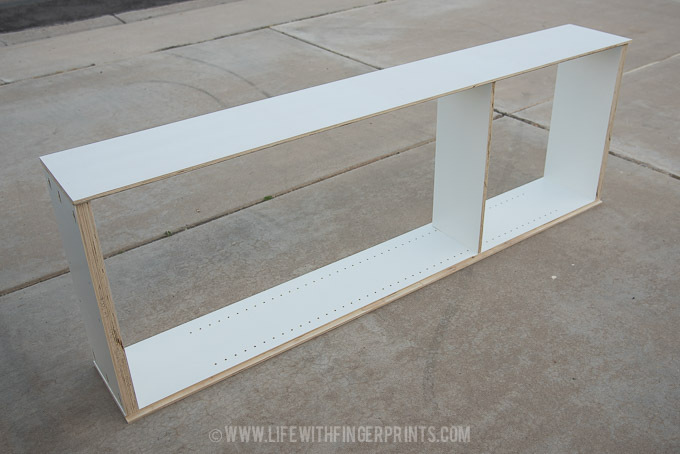 By the time we got to this point, I naively thought, “Wow – we’re almost done!” Our bookcases were built and painted. The face frames were built and painted. All we had to do was install it. How hard could it be? !